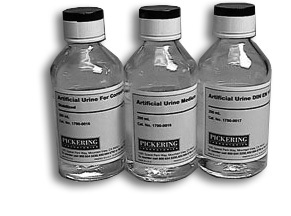 This artificial urine is designed for testing metallic biomaterials used to produce urological implants and catheters. This is a ready-to-use solution at pH 6.0+/- 0.4. This formulation contains non-toxic preservative to avoid bacteria growth and can be stored at room temperature. Custom formulations are also available.